Each piston is assigned a tracking number; all pistons can be tracked by unit, site, and by repair with our proprietary component tracking program. This allows our customers to budget and plan for scheduled maintenance and overhaul repairs, and track compressor components. Clean, precisely measure, and inspect all piston rod assemblies; treat with a rust inhibitor. Remove and install compressor pistons on compressor rods (in shop or field). 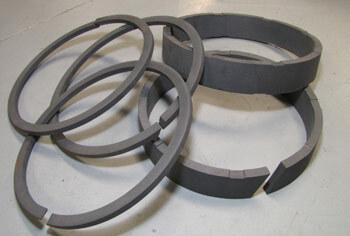 We supply rings and wear bands from carbon-filled Teflon to Peek. See our Parts.